I recently ordered one of Synthcube's am4023 VCF kits. This is a kit version of Rob Keeble's PCB that he did some time ago, which is based on the Odyssey 12db 2 pole VCF circuit. The kit is available in 1U & 2U versions, in both minijack and banana. I got the 1U minijack kit. I don't have any 'stock' frac filters in my rig - I have a MMM VCF that I built from their kit and a LPG, which can act as a filter. So I jumped at the chance to get a 1U wide filter, as that's the only space I have left. The PCB was easy to put together. It started to get a bit fiddly when it came to mounting the sockets, pots and PCB to the panel - there isn't much room at all behind the panel. This bit would be easier on the 2U wide panel I would guess. I haven't come across the sockets that are used before, they look nice and have a nice feel to them. But I lack the right tool to tighten the washer - it is a circular type with 2 small slots. The instructions didn't mention which lugs were which (signal, ground), but a quick test with the meter soon sorted that out. The knobs go right to the edge of the panel, and the pots stick out a bit at the side, but it doesn't seem to interfere when racking up the module. The layout of the controls seems a bit unconventional, I expect freq/res at the top on a VCF, but they are in the middle on this one. I can't say how it compares to any of the Blacet filters, as I've never heard one. But this is a really nice sounding filter. I haven't properly calibrated it yet, but it has a really nice sounding sine wave when self oscillating. Unusually there is a fine tune control so you can really tune in the sine wave to the desired pitch. I can see myself using this as the basis for some BD patches. It's hard to describe filters sometimes, but this one sits on the 'smooth' side rather than 'wild' or 'harsh' (like a MS20 for example). Just feeding it a single sawtooth I was also able to get some fairly 'acid' type tones out of it. Considering the effort that has gone into this kit, the price is very good value - just under $100, which for me worked out at about Ã‚Â£65 plus shipping. The good news for me was customs didn't get their grubby hands on it! it's true we don't often get a new filter around these parts..any chance of an audio sample? werock, thanks for the feedback. comments noted for future kits! Ok, here's a couple of quick samples. The first is some general wiggling of the frequency and res controls, ending up in bass drum like oscillation. The second has an lfo modulatng the frequency, while gradually upping the resonance. Synthcube, I can't find these (2u only) on you website. Want I'm looking for is the 1u minijack version, same as Werock's. That one I can't find on the website. Just about to start a build for the AM4023 pcb I bought from you about a month ago. Going to stick it behind a Eurorack panel. I checked the synthcube site but struggled to find any hires picks of a completed dotcom/MU module. Do you have any I could see for a visual guide before I drill the panel? if you go to www.synthcube.com/cart and search '4023' you should see the MOTM, dotcom/MU and Frac panel versions, in 1U and 2U wide- lots of options for you! Yeah, I've seen all those pics, cheers. This is my first DIY panel. Drilled the holes myself! Slightly off but I don't care. Panel design by my daughter Catherine with a permanent marker. make this a 12v unit on the pcb as I'm a Eurorack whore! would be a learning experience and most appreciated! but now it's getting scary! Most importantly, that is an AWESOME panel! 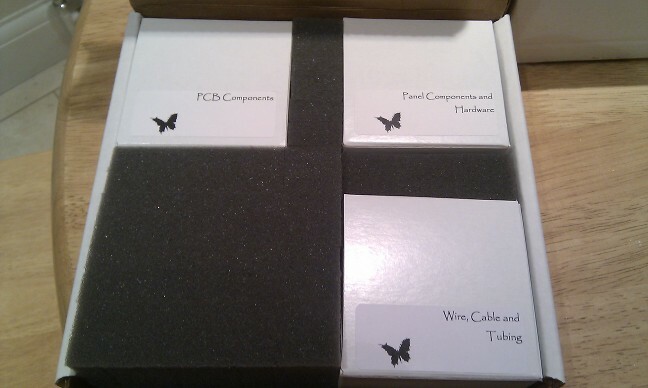 I will take some pictures of the PCBs and get them to you. It's a really straightforward build.. There are no adjustments required for euro/12v.. 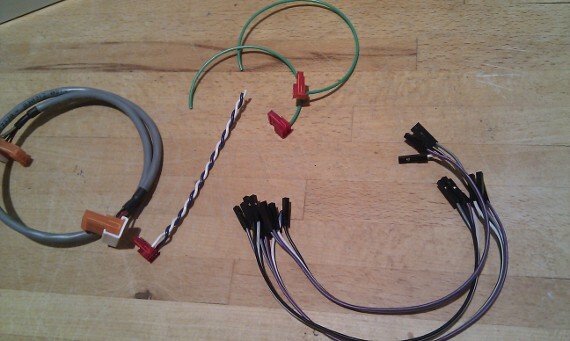 In fact the circuit was designed for use in a euro system originally . 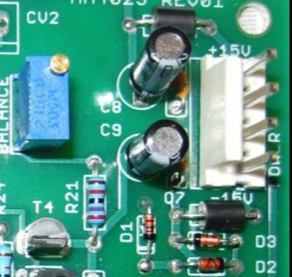 The only change will need to be an adaptor to connect the euro power cable to the 4pin power header, or you can directly solder to the PCB holes. This is simply wonderful news! 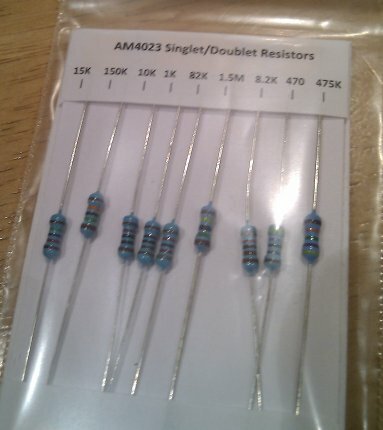 The only thing holding me back from getting started is the farrite inductors. Not sure which specific rating to use. Plus adapting it for 12v operation in my Eurorack format. Mostly I see the 4/5mm long ones being used. Cheers mate. Sourced some on ebay for pretty cheap. What does the 2u version have that the 1u doesn't ? The synthcube site keeps giving me errors when trying o get info on it. Any one patching 2 of these in series for some 24 db action ? The 2u has a second CV in with attenuator and three inputs (one direct, two with attenuators). 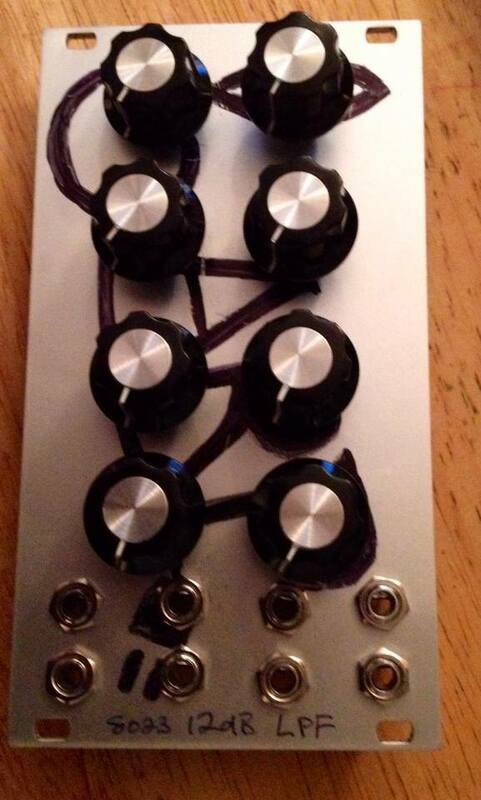 I plan on building a second one soon, mainly because I'd like to use one for kick drums and one as a VCF. Would you please send us an email with your browser version so we can check the issue with the site? Apologies for any inconvenience. What's your email address ? You can use the contact form at www.synthcube.com/cart, or email is: info at synthcube dot com.